This is the same recipe as the vanilla home made ice cream, except I tried it out using brown sugar. My husband did not like how it turned out, he said it was good going down, but left a film in his mouth. This sounds interesting! 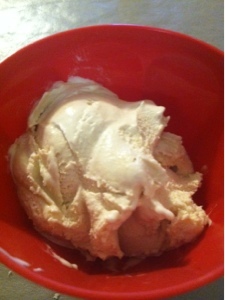 So far the only flavor of ice cream I didn't like was my homemade pumpkin ice cream ~ yuck! Maybe the store-bought is better.